MOUNTAIN VIEW, CA--(Marketwired - Feb 26, 2014) - Kahuna, the mobile marketing automation company, today announced a significant expansion of its platform. Kahuna's new AtoE Testing™ and Push Response Tracking tools provide unprecedented insights into the effectiveness of mobile marketing campaigns, allowing marketers to deliver the right message at the right time to grow app usage and revenue. To help Kahuna continue developing its best-of-breed mobile marketing solution, scale operations, and expand its customer base, the company secured $11 million in Series A funding from Sequoia Capital. Sequoia partner Omar Hamoui, the founder of AdMob, has joined Kahuna's board of directors. Kahuna also announced that since launching just four months ago, it has extended its reach by adding several major customers to its portfolio, including Yahoo, 1-800-Flowers and the New England Patriots. Additionally, Kahuna announced a deep integration and partnership with Branding Brand, the world's fastest-growing mobile commerce platform provider, giving another 250+ retailers immediate access to Kahuna's comprehensive solution. "Kahuna has developed a sophisticated solution for marketers, combining best practices with automation. It has leapfrogged every other vendor to create the gold standard in mobile marketing automation," said Mr. Hamoui. "Adam, Jacob, and their team focused on applying innovative technology to one of the marketing industry's biggest pain points -- mobile engagement. The result has been rapid adoption by mobile leaders who understand what a substantial difference Kahuna can make in determining the success of mobile marketing efforts." Kahuna's AtoE Testing™ technology moves beyond even the newest industry trend of A/B testing to help marketers efficiently direct energy and resources. With AtoE Testing™, marketers simultaneously test five different messages against a control group to determine what resonates with consumers. AtoE Testing™ enables marketers to quickly and confidently know the best message to send, at every point in the customer lifecycle. To further assist marketers, Kahuna created the industry's first tool to accurately gauge exactly how push messages are received by respective audiences. As mobile marketers typically push more than 10 million messages per month, Kahuna's Push Response Tracking shows customers the impact of those messages for the first time. Push Response Tracking digests a myriad of inputs, including reactions to every push message. Kahuna then runs a proprietary algorithm, created and refined by the best mobile marketers in the world, to provide hard data and a definitive answer to how audiences respond to campaigns. "Until Kahuna, mobile marketing remained a multi-billion dollar mystery," said Kahuna CEO Adam Marchick. "Our goal is very simple. We want to unlock that mystery so that companies can tap into mobile to engage, delight, and retain customers in a friendly and respectful way. We are building the Analytics that matter and the Marketing that works." Kahuna has developed a rapidly growing base of enthusiastic customers, including several Fortune 1,000 companies. Since choosing Kahuna, customers have delivered 10s of millions more app engagements because of Kahuna Campaigns. A slew of new customers, including Yahoo, 1-800-Flowers and the New England Patriots, recognize Kahuna's value and view it as their crucial solution for mobile marketing. "Kahuna is the clear winner in marketing automation for mobile," said Amit Shah, Vice President, Mobile at 1800flowers.com. 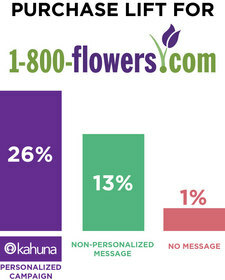 "We evaluated many mobile marketing providers, and Kahuna has a disruptive product well suited for 1-800-Flowers. It is a 'must have' for mobile commerce companies." Through Kahuna's seamless integration with Branding Brand's B2E Platform, its impact becomes even more significant. Now Kahuna's solution can be utilized instantly by more than 250 premier retail brands, such as American Eagle Outfitters, Crate & Barrel, and Ralph Lauren. "We evaluated all providers, and it was clear that Kahuna would deliver the most value to our customers," said Chris Mason, CEO of Branding Brand. "Kahuna has built unique technology that has 'wow' factor when marketers use it. We are rolling this out with a dozen clients to begin, but I see no reason that every one of our 250 clients wouldn't benefit from this powerful technology." Kahuna allows companies like 1-800-Flowers to deliver the right message at the right time to grow app usage and revenue.